Flooding in Clifton often yields some cool artifacts. Its not uncommon to find some neat, old bottles in the sediments that wash downhill from the flood waters. On this occaision while looking for bottles I discovered something very unique and unexpected and Indian Quartz point. 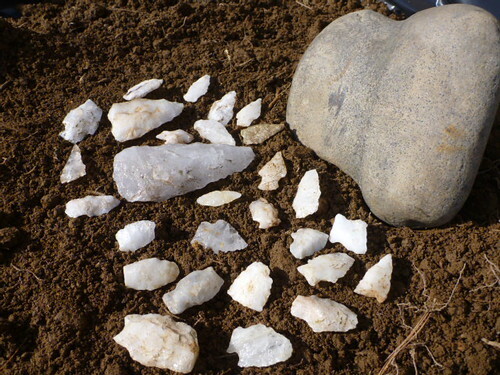 An expert claimed that it was created possibly hundreds of years ago but was unfinished by the Indian and that if it would have been completed would have been manufactured into a smaller arrow or spear point. Either way it was laying on top of the ground next to a tree amongst modern debris. Its not the first time I have found these in this way. All of the ones I have found in the past have been by accident where I stumble upon them lying next to a tree or in adried creek bed or even in a pile of construction dirt.